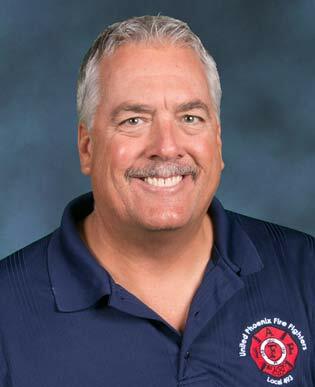 Brian Moore, a resident of the Desert Hills community since 1998, has served as Board Chairman of the Daisy Mountain Fire District since January of 2007. He became involved in the district in 1999 when he was appointed to one of the citizen member positions on the Daisy Mountain Fire Pension Board. In May of 2002, he was appointed to fill a vacancy on the five member fire district governing board and was elected to a four year term in the November, 2002 general election and re-elected to another four year term in the November, 2006 general election. In that time frame, Brian has seen the district grow from a small, two station department with two high mileage fire engines and one ambulance with dilapidated trailers for housing on-duty firefighters and primitive metal awnings for protecting fire apparatus to a department consisting of four permanently constructed fire stations housing four engine companies, a ladder company, two paramedic ambulances along with an on-duty battalion chief protecting residents in a district of nearly 100 square miles in size. Brian has nearly 30 years of fire service experience beginning in 1980 as a volunteer firefighter/EMT for the Anderson Township Fire Department, located on the outskirts of the Cincinnati, Ohio area. Brian became a certified paramedic in 1983 and continued his volunteer service as a firefighter/paramedic while pursuing his college degree. Following his graduation in 1985 from the University of Cincinnati where he received his Bachelor of Science Degree, Brian became a full-time firefighter Paramedic for the Anderson Township Fire Department. Brian also served the Springdale, Blue Ash and Green Township, Ohio Fire Departments in a part-time capacity during the mid 80’s. For the past 16 years, Brian has worked for the City of Phoenix Fire Department where he currently serves as a Fire Captain-Paramedic assigned to one of the department’s three highly specialized heavy rescue squads. Brian is also a certified Hazardous Materials Technician and Technical Rescue Technician and is a member of the Phoenix Fire Department’s national Urban Search and Rescue (USAR) Team. Brian is also a national instructor for hazardous materials and confined space rescue training. He previously served on the National Fire Protection Association (NFPA) Occupational Medical and Health Technical Committee. Brian has been active in many community roles including having served as a youth soccer and baseball coach and is actively involved with the Valley of the Sun United Way where participated in the “Loaned Executive Program” in 2004 and for the past four years, has served on the Valley of the Sun United Way’s Campaign Cabinet. Brian also serves on the Town of Cave Creek’s Citizen Water Advisory Board, the City of Phoenix Fire Pension Board and the City of Phoenix Deferred Compensation Board that oversees the City’s 457 and 401(a) programs. Brian is also an executive board member of the United Phoenix Fire Fighters Association and previously served as president of Fire-PAL, a non-profit organization made up of professionals with backgrounds in business, law and accounting who assist the Phoenix Fire Department with safety campaigns such as the “Just a Few Seconds” drowning prevention program. As a graduate of the University of Cincinnati, Brian serves as the Phoenix Alumni Network Leader for UC Alumni living in the Phoenix area. Brian has been married to his wife Julie, a City of Surprise Fire Captain, for nearly 20 years and they are the proud parents of three very athletic children- two high school aged sons attending Boulder Creek and a daughter attending Desert Mountain. Besides closely following his kids’ athletic events, Brian’s hobbies include snow and water skiing, swimming and following his favorite professional and college sports teams.